The race between Joc Pederson and Kris Bryant for NL Rookie of the Year is neck-and-neck, while in the AL, super prospect Carlos Correa makes his Awards Watch debut. After years of disparity between the American and National Leagues in the quality of their Rookie of the Year races, we’re finally getting a compelling competition in both this year. In the AL, we have yet another new leader and two new names in the race, including one of the game’s top prospects. In the NL, the top three spots are unchanged from three weeks ago, but the top two candidates are now in a virtual dead heat, making it anybody’s race from here on out. Note: All stats are through Wed., July 8. League leaders are in bold, major league leaders in bold and italics. The number in parentheses after a player's name reflects his rank on the previous list. Rookies are players who, prior to the current season, had fewer than 130 at-bats or 50 innings pitched in the majors or spent fewer than 45 days on the active roster prior to rosters expanding on Sept. 1. • MORE MLB: Picking All-Star surprises, snubs | Who should win Final Vote? Pederson’s slump is now a significant concern. Since leaving Colorado on June 3, he has hit just .170/.323/.302 with three home runs in 130 plate appearances over more than a month of games. His walk rate is still excellent (16%), but it’s the only part of his game that hasn’t collapsed. The advanced fielding metrics are increasingly disapproving of his overall play in center, despite his many highlight-quality plays and Vin Scully’s ringing endorsements. His power has vanished, his average is down to .231 and his speed has yet to manifest itself in the majors (he’s been caught stealing five times in seven attempts). He was so good before that recent slump that I’m keeping him in the top spot this week, but his lead is paper-thin at this point and could evaporate by the weekend. The only reason Bryant hasn’t passed Pederson is that the former also cooled off in late June, hitting .167/.295/.361 over the final 11 games of the month. He has perked up since, however, hitting .276/.382/.586 in eight July games. He is also grading out better than expected in the field as the sample size for those metrics increases, and he continues to be a threat on the bases, both by stealing eight bags in ten tries on the season and by taking the extra base in 55% of his opportunities to do so (compared to Pederson’s 30%). Pederson still has that paper-thin lead, but at this moment, Bryant looks like a better bet to win the award. Duffy was hitting .300/.344/.485 a week ago, but has slumped since, going 3-for-24 with just one walk and no extra-base hits. He continues to occupy the middle ground between the two All-Stars that top this list (and likely will all season) and the new faces trying to fight their way into the race. The final two spots on this list speak to how much I trust partial-season defensive statistics. Franco, whom the Phillies made their starting third baseman on May 15, has absolutely raked since the calendar flipped to June, hitting .340/.396/.603 with eight homers and 26 RBIs in 154 plate appearances over his last 35 games. However, the defensive metrics gut his Wins Above Replacement totals (0.9). I don’t doubt that Franco, who has long been viewed as a future first baseman, is lousy at the hot corner, but I have a hard time blaming him for the Phillies’ refusal to bench Ryan Howard (.217/.264/.434 and more than a win below replacement on the season) or seeing past that spectacular batting line. In contrast to Franco, Ahmed grades out as an elite defender at shortstop and, as a result, has been a more valuable player per WAR (2.2). I have no doubt that Ahmed, whose biggest weapon in the field is an incredibly strong and accurate throwing arm, adds significant value in the field, but I don’t trust the advanced metrics to provide an accurate assessment based on a mere half-season sample. Instead, I see him as an above-average defensive shortstop who, thanks to a recent hot streak, has brought his batting line up to roughly the league average for his position. On that last point, the average major league shortstop has hit .256/.302/.368 on the season, good for an 89 OPS+. Ahmed, who plays in a hitter-friendly home ballpark, has an OPS+ of 85. Consider Franco and Ahmed in a virtual tie here, with Franco’s fourth-place ranking reflecting the fact that I trust his batting line more than I trust either player’s defensive numbers. Ahmed, meanwhile, edges teammate Robbie Ray off this list in large part due to their disparity in playing time. Ahmed has been the Diamondbacks’ primary shortstop all season, while Ray, impressive as he’s been, has made just eight starts for Arizona. 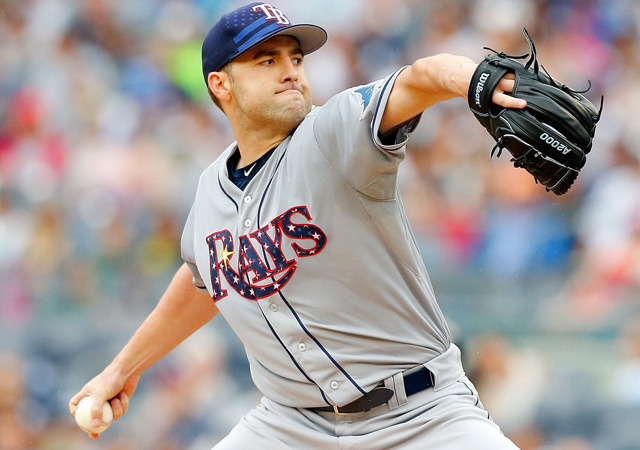 Karns may not be the sexiest name on these lists (literally), but an above-average starting pitcher is incredibly valuable, and Karns has been that for the Rays all season long. Only seven of his 17 starts have been quality, but that’s largely due to a quick hook. He has allowed two runs or fewer in 13 of those 17 starts, including each of his last five turns, four of which were quality. His last time out, he took the mound in Yankee Stadium on July 4 and held New York to two runs over seven innings while striking out ten. I don’t expect Karns to win this award, but to this point in the season, he has been the most valuable rookie in the AL. Burns’s 17 steals, which have come at an 85% success rate, are the second-most in the AL behind Jose Altuve’s 25 (at 76%). His .318 average is fifth in the league behind four more All-Stars and ahead of a fifth. As a speedy leadoff man, he could stand to draw more walks (he has just one in his last 85 plate appearances), but his on-base percentage is still second on the A’s (behind that of yet another All-Star, Stephen Vogt), and his production has been remarkably consistent since he went 2-for-5 in his May 2 debut. The advanced metrics have become a bit more mixed regarding his play in center, but the total package is still a very valuable player. Travis was the easy leader in this race before a shoulder injury cost him 36 games, but he returned to action on June 26 and has put up strong numbers once again. That’s a good indication that he’ll be in this race to the end, though the loss of more than a month of the season means that the head start he got by making the Opening Day roster (one still benefiting Karns) is gone. Once a significant part of the Royals’ heralded 2010–11 farm system, Montgomery was ranked the No. 19 prospect in the game by Baseball America heading into '11, but struggled in Triple A that season and the next and was included in the trade that sent Wil Myers to Tampa in December 2012. His struggles continued in the Rays' system, with Baseball Prospectus describing him as “mechanically inconsistent, mentally fragile and prone to the big inning” in their '14 annual. Traded again this spring—straight up for Erasmo Ramirez—on March 31, Montgomery showed improvement in Triple A in April and May and finally got his first major league opportunity on June 2 as a replacement for the injured James Paxton. Montgomery held the Yankees to one run over six innings in his debut and hasn’t looked back. Of his seven starts thus far, five have been quality. The exceptions have been his last turn, in which he fell just one out shy, holding the A’s to one run over 5 2/3 innings, and his June 18 outing, in which he held the Giants to three runs through seven innings but had an inherited runner score after he had been removed from the game in the eighth. In between those two starts, Montgomery, who turned 26 last week, became the first rookie pitcher in nine years to throw consecutive shutouts, blanking the Royals on five singles and no walks while striking out ten, then taking a no-hitter into the seventh in San Diego before ultimately shutting out the Padres on one hit and four walks. Correa has the all-around ability to come from behind and win this award, but his was the latest debut of any of the players mentioned on the AL or NL lists this week, including the two players in each league to have fallen off the list. Still, you could argue that Correa is already the best shortstop in the AL.